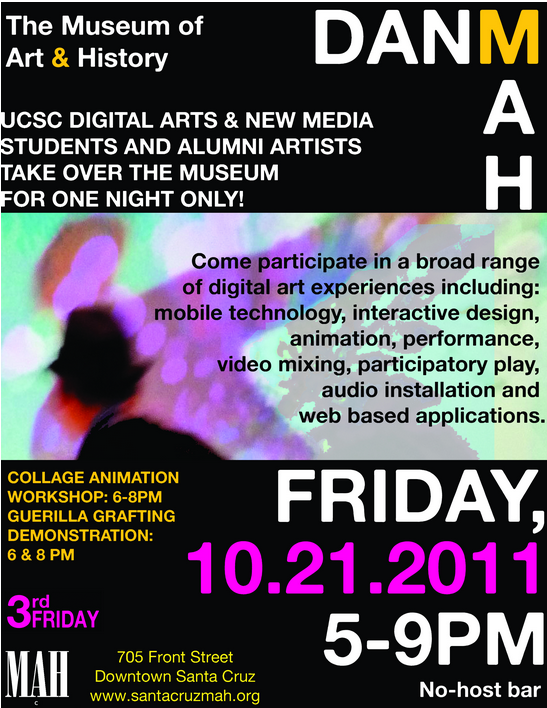 Come experience and participate in the museum’s transformation into an innovative hub of new interactive digital art and technology by UCSC’s Digital Arts & New Media students and alumni artists. Showcasing the development of a broad range of research including: mobile technology, interactive design, animation, performance, video mixing, participatory play, audio installation, and web based applications. Live demonstrations will be ongoing throughout the evening by 20 DANM artists exhibiting a range of DANM’s skills and new technological developments. For example, Tyler Freeman will perform with his VJacket, a wearable jacket with built in touch sensors that produce live video effects. Artwork from the MAH’s collection will be reinterpreted through Levi Goldman and Jesse Fulton’s drawing machine. Daniel Christopher, Lyes Belhocine and Drew Detweiler’s Data Surf is an interactive surfboard interface that rewards participants with their own mirrored image in a barrel of colorful swirling visuals when they achieve balance and equilibrium on the surfboard. 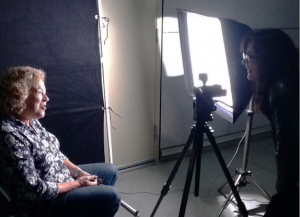 Nada Miljkovic’s The Sad Song Project invites participants to come and share their sad songs through her video and social networking piece that aims to help the community release its emotions through song. These are just a few amongst many exciting cutting edge projects the event will feature. 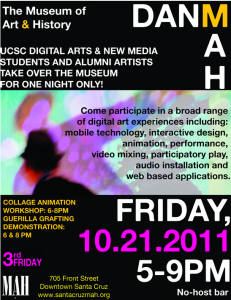 Artist, Jolie Ruelle will hold a collage animation workshop from 6-8pm. The final collaborative visitor made film will be shown at 8:50pm. Two members of the Guerilla Grafters, a group of artists grafting fruit bearing branches on urban trees as a statement about food accessibility, will demonstrate urban grafting at 6 & 8pm. Participating artists include: Lyes Belhocine, Lea Cox, Daniel Christopher, Drew Detweiler, Miki Foster, Tyler Freeman, Jesse Fulton, Levi Goldman, Jessica Faith Hayden, Margaretha Haughwout, Lindsay Kelley, Nick Lally, Natalie McKeever, Kyle Forrest McKinley, Nada Miljkovic, Chris Molla, Helen Hyun-Kyung Park, Andrew Pascoe, Dustin Raphael and Jolie Ruelle. Please see the DANM website for more information on these artists and their featured works. I dug into the Artist on Art vaults and found an interview back from March of 2009 featuring the newly “minted” PhD graduate Lindsay Kelley talking about her art.